Even before the recent heavy rains caused flooding in Western New York, Lincoln Park in the Town of Tonawanda had problems with standing water, Town Engineer James Jones said. "It's messy, and we wanted to be sensitive and creative with how we dealt with this storm water. We didn't just want to dig a trench and put in a pipe. That's not healthy for the trees," said Jones. That is why the town will install a 1.5-mile pedestrian and bike trail at Lincoln Park. 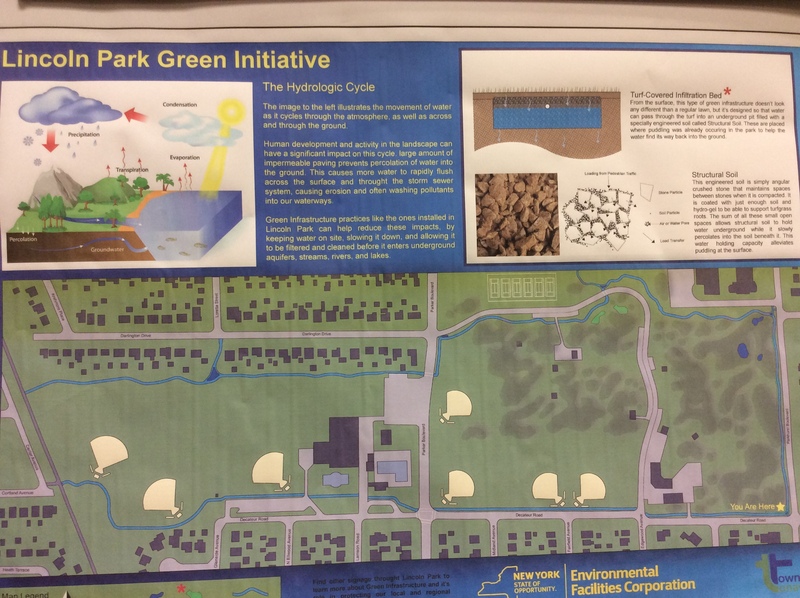 The trail will be made of a porous material designed to absorb and filter storm water, and town officials hope the trail will help solve the park's drainage problems. Louis Del Prince and Sons Inc. of Cheektowaga submitted the lowest of seven bids, $953,668, and the Tonawanda Town Board approved the new porous trail Monday. The Lincoln Park Trail will run along Decatur Drive to the south, east along Parkhurst Boulevard and then through the park, behind Franklin Elementary and Middle School, and west linking with Parker Boulevard and Darlington Drive. Town of Tonawanda outlines plans for a new trail around Lincoln Park. Jones noted the Lincoln Park trail will link up with the existing 2.5-mile Tonawanda Rails to Trails, which opened last summer. "We're calling this our inner loop. It's going to bring people from the Rails and Trails into (Lincoln) park and they will be able to go around the park and back onto the trail," said Councilman John A. Bargnesi Jr. "We really wanted this to happen." Councilor Lisa M. Chimera agreed. "People take such pride in their parks and it's important to make this park the best it can be," he said. The project will be funded by $700,000 in New York State Green Infrastructure grant money, as well as additional funds in federal community block club funds and state Department of Environmental Conservation funds. The town will provide $78,000 of in-kind services as its local share. The town had originally planned to award a bid in February, but it was forced to look for $100,000 in additional state money after the bids came in higher than expected, said Jones. "This just demonstrates the town's commitment to green infrastructure and walkability," said Jones. Jones told town officials that most of the Lincoln Park trail will be completed in late summer or fall, but the delay in garnering funding may delay the completion of the full project into next year's construction season. Jones said the porous material that Tonawanda will use to pave the trail also was used by the City of Buffalo for its bike trail on Kenmore Avenue.